The Memory quilt block could prove to be challenging for a beginner quilter, due to the number of pieces required to make the block. This quilt block contains 49 pieces. These pieces are sewn in groups of patches and then those groups are sewn together as a nine patch. 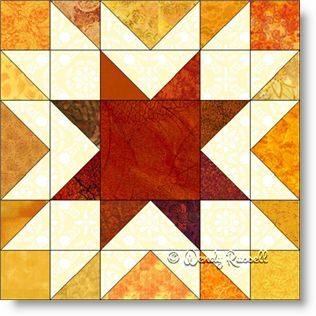 I have chosen to use bright oranges and yellows because this block looks to me to be a star, so I just went with that. It would be spectacular in shades of blue or as a totally scrappy quilt block. You just need to pay attention to the colour values in order to achieve the same effect. The sample quilts illustrated are using common quilt layouts. The blocks in one quilt are set side-by-side but separated with sashing to add some additional interest. The second quilt sets the blocks on point for a totally different look.